my momma told me… – welcome! oh no! got tagged by the sensitive and introvert one. much as i don’t like doing meme, i guess i have to oblige my blogging mate, howsy. since this is also an easy meme, might as well give it a go. ok, the instructions first. it’s the "my momma told me…." meme. All you have to do is pick 5 news articles that you think your momma would have told you to do/not to do. It could be anything. From "…not to listen to Blah’s crap" to "…never tell a lie on national TV" like that. You are given the choice to tag or not to tag 5 others. Simple! must have to do with news articles? that made it a little difficult. i thought simply tembak with "my momma told me…" – that would be easy. i notice though some people howsy tagged did not stick to this rule of something to do with news articles. ok, never mind, i’ll try to think of something. 1. my momma told me… why didn’t i study hard enough when in school for my exams (eg UPSR, SPM, STPM). if not, see, i can have my pictures in the paper. 2. my momma told me… don’t you ever said you are only defending christianity when you critcised the other religions. 3. my momma told me… if you ask people to tell you the truth, then learn to accept it! 4. my momma told me… learn to accept my own mistakes and don’t forever blame it on act of god. 5. my momma told me… stand on your own! don’t depend on handouts because once you do, you’ll forever depend on the handouts. there! all done with! so can you spot which news/persons i was referring to? take five meme – name names ok! look ma! 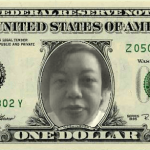 i’m on the US dollar bill! 2 Responses to "my momma told me…"
I am a female Chinese Malaysian, living in the Washington DC area in the United States. I have read many of the letters that often talk about foreign countries when the writers have no real knowledge of actually living in those countries. Many draw conclusions about what those countries are like after hearing it from someone else or by reading and hearing about them in the media or after four years in a college town in those countries. I finished STPM with outstanding results from the prestigious St George’s Girls School in Penang. Did I get a university place from the Malaysian government? Nothing. With near perfect scores, I had nothing, while my malay friends were getting offers to go overseas. Even those with 2As got into university. I was so depressed. I was my parents last hope for getting the family out of poverty and at 18, I thought I had failed my parents. Today, I understand it was the Malaysian government that had failed me and my family because of its discriminatory policies. Fortunately, I did not give up and immediately did research at the Malaysian American Commission on Education Exchange (MACEE) to find a university in the US that would accept me and provide all the finances. My family and friends thought I was crazy, being the youngest of nine children of a very poor carpenter. Anything that required a fee was out of our reach. Based on merit and my extracurricular activities of community service in secondary school, I received full tuition scholarship, work study, and grants to cover the four years at a highly competitive US university. Often, I took 21 credits each semester, 15 credits each term while working 20 hours each week and maintaining a 3.5 CGPA. A couple of semesters, I also received division scholarships and worked as a TA (teaching assistant) on top of everything else. For the work study, I worked as a custodian (yes, cleaning toilets), carpet layer, computer lab assistant, grounds keeping, librarian, painter, tour guide, etc. If you understand the US credit system, you will understand this is a heavy load. Why did I do it? This is because I learnt as a young child from my parents that hard work is an opportunity, to give my best in everything, and to take pride in the work I do. I walked away with a double major and a minor with honours but most of all a great lesson in humility and a great respect for those who are forced to labour in so-called ‘blue collar’ positions. Those of you who think you know all about Australia, US, or the West, think again. Unless you have really lived in these countries, i.e. paid a mortgage, paid taxes, taken part in elections, you do not understand the level of commitment and hard work it takes to be successful in these countries, not just for immigrants but for people who have lived here for generations. Every single person, anywhere, should have the opportunity to succeed if they want to put in the effort and be accountable for their own actions. In the end, they should be able to reap what they sow. It is bearable that opportunities are limited depending on how well-off financially one’s family is but when higher education opportunities are race-based, like it is in Malaysia; it is downright cruel for those who see education as the only way out of poverty. If you want to say discrimination is here in the US, yes, of course it is. Can you name a country where it doesn’t happen? But let me tell you one thing – if you go looking for it, you will find it. But in Malaysia, you don’t have to go look for it because it seeks you out, slaps you in your face every which way you turn, and is sanctioned by law! Here in the US, my children have the same opportunity to go to school and learn just like their black, white, and immigrant friends. At school, they eat the same food, play the same games, are taught the same classes and when they are 18, they will still have the same opportunities. Why would I want to bring my children back to Malaysia? So they can suffer the state-sanctioned discrimination as the non-malays have for over 30 years? As for being a slave in the foreign country, I am a happy ‘slave’ earning a good income as an IT project manager. I work five days a week; can talk bad about the president when I want to; argue about politics, race and religion openly; gather with more than 50 friends and family when I want (no permit needed) and I don’t worry about the police pulling me over because they say I ran the light when I didn’t. How about you………….? lucia: thanks for your interesting, insightful sharing. er… methink this is suppose to be under the post ‘in pursuit of A’s’, right? i will move it there then later.